Designed in 1952, the Winchester .308 cartridge made it’s appearance two years before the NATO 7.62x51mm. 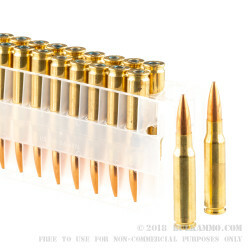 The .308 was introduced to the hunting market and it has become the most commonly used civilian round for short action hunting and target shooting. Police and law enforcement still swear by it reliability and accuracy as well. The short casing makes the .308 Winchester well met for short-action rifles. 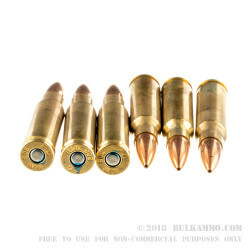 Very Similar to the 7.62x51mm NATO round, but not quite identical; the interchange of these rounds has been considered safe by SAAMI (Sporting Arms and Ammunition Manufacturers Institute) standards. With a muzzle velocity of 2600 fps and muzzle energy of 2627 ft/lbs., these “small” rounds still pack a huge punch. 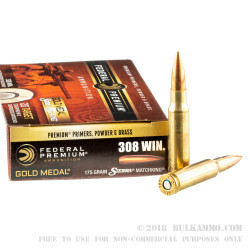 These Federal Premium Gold Medal rifle loads are made with an exclusive primer design to create the best sensitivity and consistent ballistic measurements. The boat tail hollow point rounds are engineered with a uniform match jacket to ensure accuracy, exclusively primed and specially formulated to provide you the most bang for your buck. Federal Premium is a company we’re all familiar with, and for good reason. 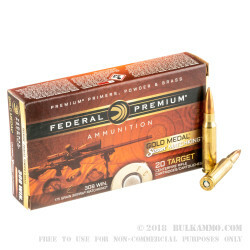 Since 1922, Federal has been working tirelessly for the consumer to provide reliable quality ammunition and have secured their place as one of the top experts in ammo production.